Northside Power excels in standby generator service, sales, and installation. We are Arkansas’s only Premier Power Pro Generac dealer and are dedicated to the standby generator market. We service, sale, and install all the top brands like Cummins, Generac, GE, Briggs & Stratton, and Honda. No matter what your generator needs are – standby, portable, natural gas, L.P., or Diesel – the solution is right here with Northside. Our fully licensed and factory certified technicians are trained to provide the fastest, most reliable service available. Call us today 501-315-7213 or email us at info@northsidepower.com and find out how fast and affordable a standby generator can be! If you already own a system and need it serviced, email or call us, so we can schedule your service call now! Northside offers Preventative Maintenance Agreements to keep your new system operating at peak performance, including oil changes, tune-ups, and complete system inspections. These programs are designed to remove all the worry regarding brown outs, black outs, and stormy weather. Receive discounts on parts and labor when you become one of our Preventative Maintenance Agreement customers. Call us at 501-315-7213 or send us an email to find all the benefits of being a preferred customer. Rest assured that you have chosen the company that believes service is the most important quality. We are available 24 hours a day, seven days a week, to insure your safety and comfort is protected. Generator sales and service is our business! We also have a Preventative Maintenance Agreements that provides 24hr monitoring so we can keep your system operating even if you are not home! The NSP247M plan is designed for the ultimate power outage protection! The monitoring can be added to either the Silver or Gold PMP depending on your budget. Our exclusive 24hr monitoring system notifies us in the event your generator fails to start as required or scheduled. We are watching your standby generator even when you don’t have time. When it’s time for your generator to exercise weekly our system will let us know if the exercise was successful. A no overtime repair benefit so you never pay an overtime charge for repairs to your generator. This feature insures you are always protected from a power failure! Priority generator service in the event of a system failure! We will get your power on as soon as possible! When the going gets rough and the power is out, the last thing anybody wants to do is wait in line for services. 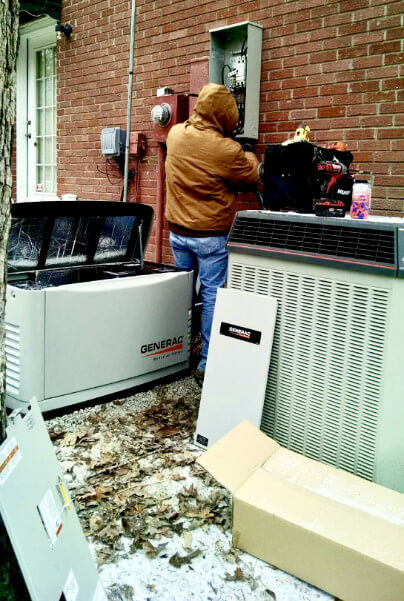 This feature moves your standby generator to the front of the line to get fast repairs!